Edition: Limited edition of 35. This print Artists Proof. Description: This woodblock print is from a series of Japanese mountains by Osamu Sugiyama. Self carved, printed and published by the artist, on medium weight paper. Signed “Osuma Sugiyama” in the lower right margin, titled and inscribed “A.P.” at lower left margin, all in pencil. Nine blocks and twenty five colours were used in making this print. The print is larger than oban with a paper size of 14 1/8" by 18 1/8" and the printed image being 11 1/4" by 15 1/4". 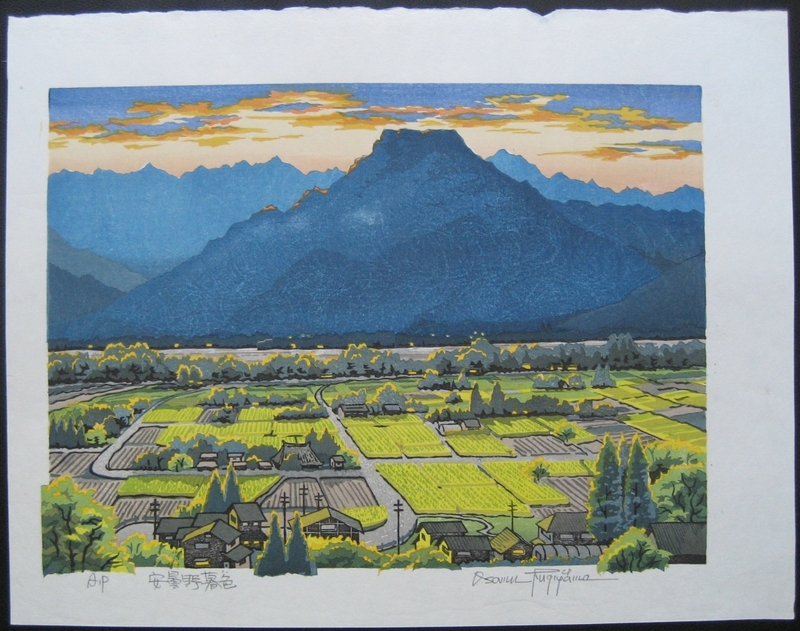 The scene is of Azumino village in Nagano prefecture at twilight with mountains rising in the background.